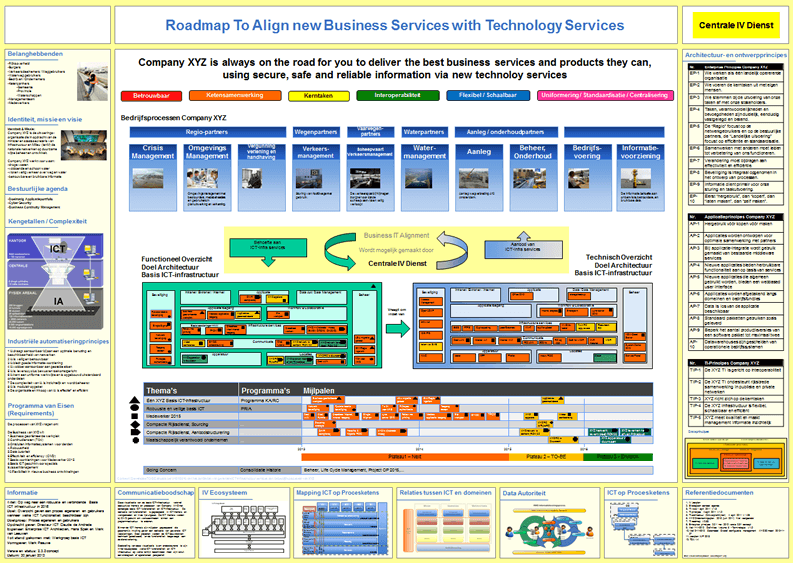 Dragon1 is the EA Tool for Enterprise, Business, Information and IT Architects. You will get more out of your architecture date: creating communication effective models and visualizations. Let your company thrive in the digital age. Evaluate this EA tool and Create your Trial account here. Dragon 1 is a saas platform for enterprise architecture that provides you the ability to create static and interactive animated architecture products for managing information much easier. Dragon 1 used as EA Tool, offers you unique features besides the basic features. This page contains important information if you as Enterprise Architect, Business Architect, Information Architect or IT Architect, Business Analyst, Manager or CIO are considering to purchase Dragon 1 and use it as one of your Architect Tools. This page addresses the functionality that Dragon 1 as EA Tool holds for you and the professional products you can create with it. We hope that you will enjoy reading this page, choosing Dragon 1 as your EA Tool. Dragon 1 consists of several integrated applications. These are the Digital Workplace, (with Task Manager), Architecture Repository, Content Viewer, Catalog, Visual Designer, ePortfolio, Search, Resource Center and Application Manager. Together these web applications support you in making any Architecture Landscape, Roadmap, Enterprise Blueprint, Scenario, Flowchart, Diagram and Document you would like to make. You can use Dragon 1 as your personal Innovation Lab. Create different versions of products and solutions. Let your owner / client choose the best. The EA Tool enables you to do your office work online, like working task-based, document creation and emailing. You get your own digital workplace in the EA Tool with access to 1) specialized applications like the Architecture Repository and Visual Designer, 2) lots of example data and templates and 3) online training and support services. Your Digital Workplace lets you be very productive because you can use a lot of checklists and task lists alone or in a team to produce valuable architecture products. Read more about the Digital Workplace here. Dragon 1 as EA Tool provides you with specialized applications like the Architecture Repository and Visual Designer that enable you to create any product, diagram, model, document or matrix as defined by common and open standards in the fields. You can do for instance requirements engineering in this EA Tool. Co-creating of products in collaboration teams! Real-time you see what your colleagues have added or changed to the products. You can immediately give feedback on the work in progress. But first, via smart versioning, you and your team can model and visualize many different versions of the product to it try out, so you really use Dragon 1 as an innovation lab. I. Enterprise Architecture - Today organizations make use of the EA Tool to visualize, compliant to open standards, ISO and IEEE, the AS-IS situation and the TO-BE situation of the enterprise, the business model, IT infrastructure and information systems. 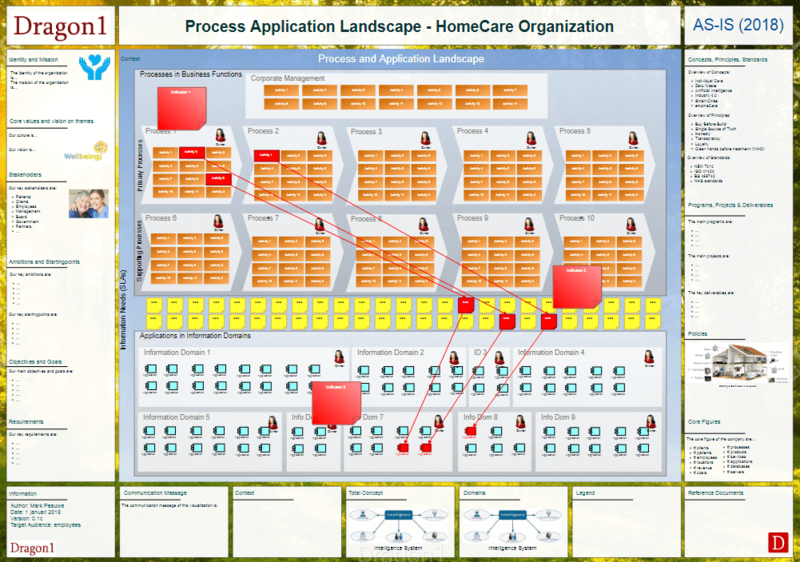 The users create visualizations of process landscapes and application landscapes models or sometimes visualize an enterprise blueprint. These architecture designs and visualizations show the strategy and the business changes supporting managing and controlling risks, savings in time and costs. II. Draw, Model and Generate - The EA Tool allows you to draw, model and generate static/dynamic, interactive and animated / playable report views (enterprise architecture diagrams) compliant to open standards using the standard extensions. You can make templated visualizations on top of views and models. If the data in the model or view changes, the visualization is automatically updated with it. III. Work with Templates and Checklists - Dragon 1 allows the user to work with checklists and templates for diagrams, models and documents. You can reuse or edit the checklists and templates or create your own checklist or template. This will raise your productivity tremendously. 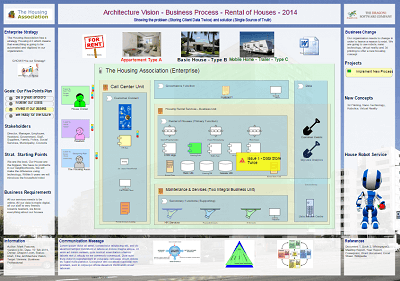 You can create interactive diagrams with indicators if static Enterprise Architecture diagrams are not sufficient. As user you can add indicators in the interactive diagrams. Also mouse over popups, with or without sound and image (youtube videos) and clickable links to background (policy) information. Use your visualization as a visual management instrument. The indicators and popup dialogs changes real-time reflecting the changes in model data. If, for example, applications and processes are not executing compliant to policy they can colored red in a visualization. You will get a popup dialog information, via mouse over, on why they are colored red. With Smart Enterprise Architecture modeling you as a user can make high-level business, information, application, technology models and much more in a smart way. 1. Single Source of Truth. You can make your own Method or Framework with meta-models having other users create compliant user models, see the image of Single Source of Truth. Next, you can produce views of these models and generate static and interactive visualizations. Finally, these visualizations can be re-used over and over again in documents and these documents can you publish via the content viewer on the web or printed out. 2. Cross Domain Modeling. Today in organizations business processes are being supported by applications which run on computers. The three concepts: business, information and technology, each with their own people, concerns, dynamics and language, are in three different worlds. For example, a business manager, network engineer or information architect are not likely to use the same language. One of the benefits of Enterprise Architecture is that you can do effective high-level cross-domain modeling. 3. Controlled Framework and Language Extensions. In practice, EA Frameworks and EA Modeling Languages are always extended. Organizations that are busy with Enterprise Architecture modeling put up rules for naming conventions (see the Resource Center for a standard naming convention). 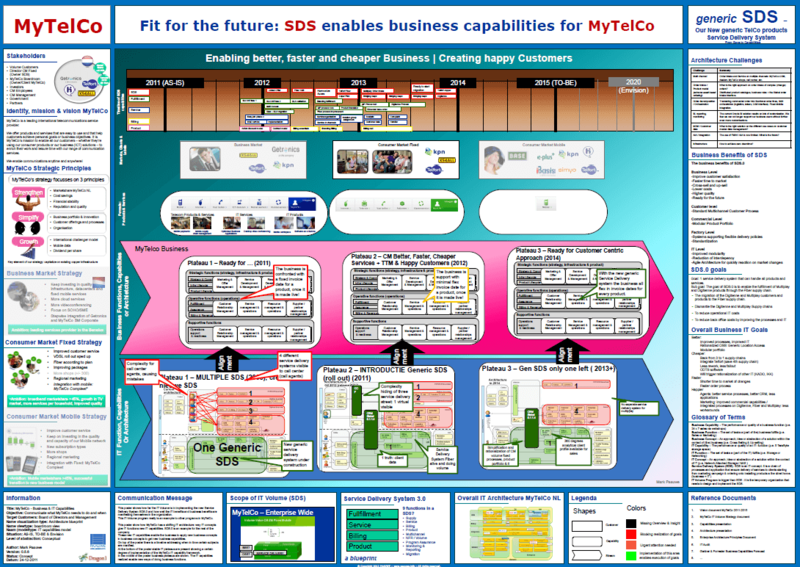 For example, the ‘business activity’ concept and the ‘business capability’ concept are two user extensions on Frameworks and Standards. On Dragon 1 we have these two available and other extra concepts for you to use right away. 4. Strict Modeling. A switch ‘Strict Modeling’ is available on Dragon 1, ensuring your models are stored compliant to open standard frameworks and modeling languages. 5. Standard Types. Many users like to work with general types of concepts. For example, Chain processes, Business processes and Work processes are three standard types of processes. Office apps, Business apps, Middleware apps are standard types of applications. File servers, App servers, DB servers are three standard types of servers. On Dragon 1 we have many common standard types available for you. 6. Dragon 1 as EA Method. 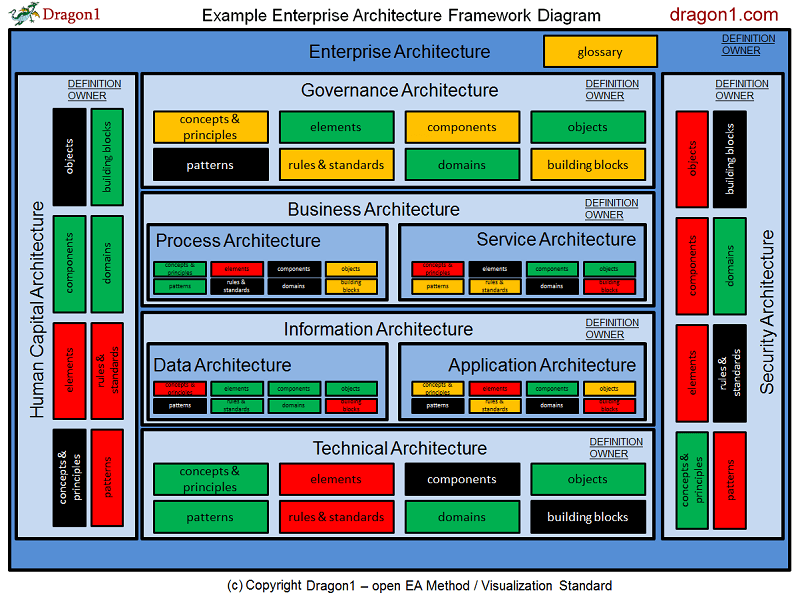 Dragon 1 is also the name of the open EA method and also an Enterprise Architecture Framework. Dragon 1 covers the development of a variety of architectures, such as enterprise, governance, business, information and technical architecture. But also solution architecture, service-oriented architecture, reference architectures, (cyber) security architecture or Human Capital architecture (HCA).